Welcome to the Walled Lake Western High School Student Activities portion of Lakes Valley Conference! Here are some highlights from the Walled Lake Western High School Student Activities and Leadership groups. Enjoy! GO WARRIORS! 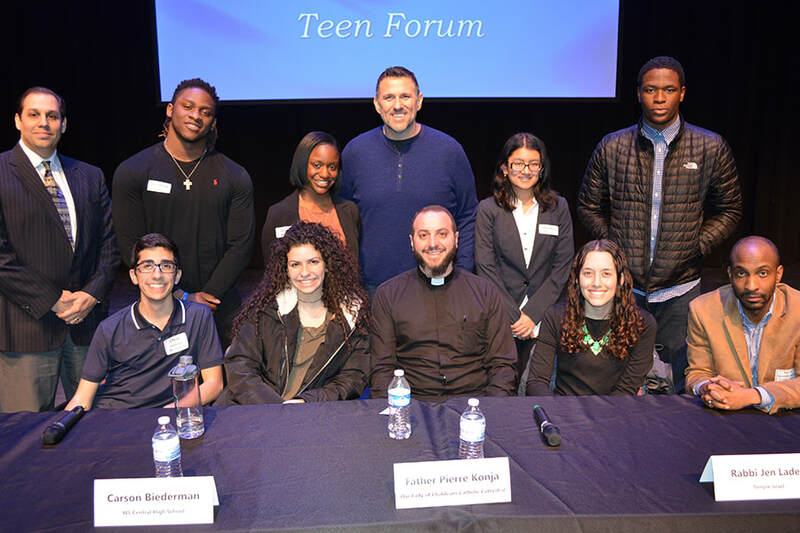 First Row (L to R): Chris Hamama, WL Central; Carson Biederman, WL Central; Father Pierre Konja, Our Lady of Chaldeans Catholic Cathedral; Rabbi Jen Lader, Temple Israel; and Rev. D. Alexander Bullock, Greater St. Matthew Baptist Church. Second Row (L to R): Dr. Christopher Delgado, Walled Lake Schools Deputy Superintendent; Jonathon Moffett, WL Western; Dalesia Malcolm, WL Western; Mojo, Channel 955-FM; Areeba Maysun, WL Northern; and Egerton Abulu, WL Northern. 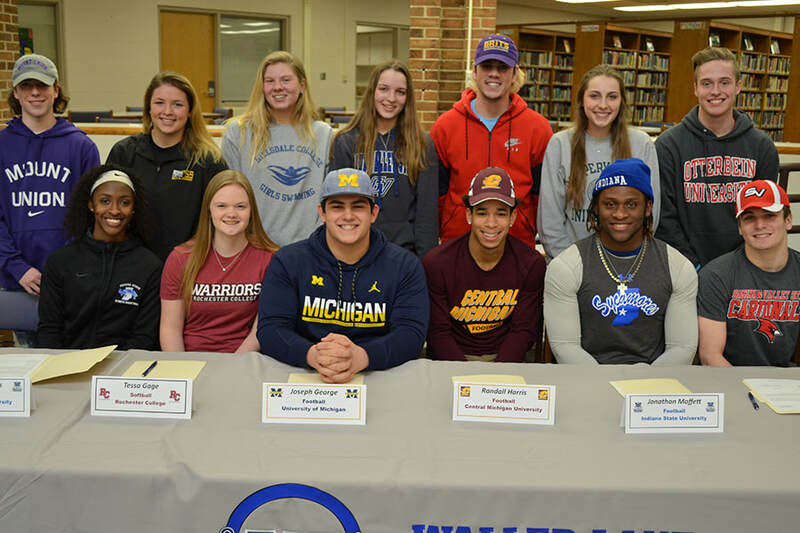 Walled Lake, MI – February 21, 2018 – Walled Lake Western High School hosted a College Commitment event on Feb. 14 for 13 student athletes that plan to pursue athletics at the collegiate level. These 13 athletes are Logan Addonizio, Thomas Baert, Julia Barrett, Rebecca Briskey, Janara Flowers, Tessa Gage, Joseph George, Randall Harris, Jonathon Moffett, Benjamin Reilly, Justin Thomas, Jordan Walczyk and Lauren Weber. Logan Addonizio plans to attend the University of Mount Union to play lacrosse. He is the son of Dianne and John Addonizio. Thomas Baert plans to attend Otterbein University to play lacrosse. He is the son of Joan and Brian Baert. Julia Barrett plans to attend Adrian College to play ice hockey. She is the daughter of Kristen and Gary Barrett. Rebecca Briskey plans to attend Hillsdale College to join the swim team. She is the daughter of Jane and Michael Briskey. Janara Flowers plans to attend Indiana State University to play basketball. She is the daughter of Jacinta and Johnathon Flowers. Tessa Gage plans to attend Rochester College to play softball. She is the daughter of Donna and Karl Gage. Joseph George plans to attend the University of Michigan to play football. He is the son of Ban and Paul George. Randall Harris plans to attend Central Michigan University to play football. He is the son of Alecia and Robert Harris. Jonathon Moffett plans to attend Indiana State University to play football. He is the son of Sonja Moffett. Benjamin Reilly plans to attend Saginaw Valley State University to play football. He is the son of Noel and James Reilly. Justin Thomas plans to attend Albion College to play football. He is the son of Chelly and Todd Thomas. Jordan Walczyk plans to attend Grand Valley State University to play basketball. She is the daughter of Maureen and David Walczyk. Lauren Weber plans to attend Slippery Rocky University to play volleyball. She is the daughter of Colleen and Philip Weber. ​For more information, contact Desmond Smith at desmondsmith@wlcsd.org. Walled Lake, MI – October 17, 2017 – Walled Lake Western High School recently celebrated its Homecoming on Oct. 13 with a wide variety of activities. WL Western hosted South Lyon High School for their Homecoming football game. The Warriors were victorious by the score of 49-28. 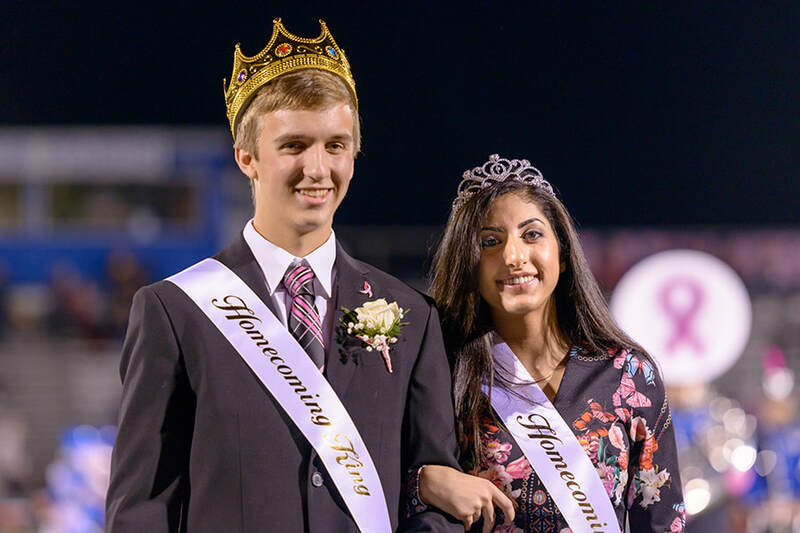 Josh Mitchell and Brenda Thwainey were crowned Homecoming King and Queen. This year’s Homecoming theme was “The Oscars”. ​The Walled Lake Western Fine Arts program is one of the best in the area and the state! From our marching band, to orchestra program, to our incredible drama program, this year putting on Joseph and the Amazing Technicolor Dreamcoat, they strive for their best day in and day out! 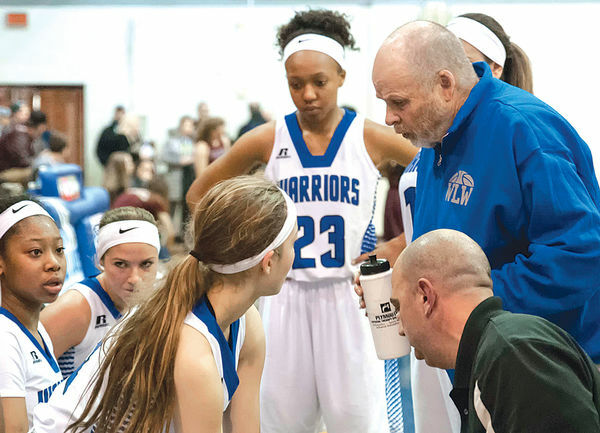 ​Congratulations to WL Western girls basketball coach, Skip Stevenson on being named Coach of the Year. Stevenson guided Western to its first district title since 1988 and its first regional victory since 1983. The 2017 Associated Press Class A girls basketball All-State team was selected by a panel of nine Michigan sportswriters. ​WL Western recently hosted their annual Volleyball Marathon fundraiser. 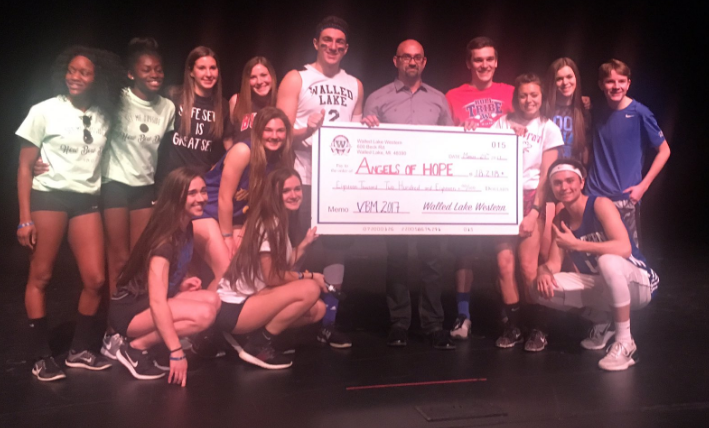 Proceeds from this year’s event benefited Angels of Hope, an all-volunteer foundation, is committed to making a difference in the lives of Michigan children and those who love and care for them as they battle cancer. Western’s Volleyball Marathon raised over $18,400.